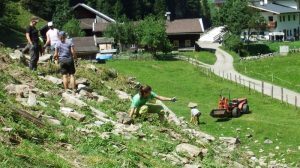 An impressive feature of the Zillertal region of Austria is the collaboration between the farmers, tourism industry, local businesses and park system. Our recent Simple Living Campers were amazed that hiking trails pass directly through farm fields, and the farmers don’t mind at all as long as you don’t let dogs run freely and you close the gates so their cows, goats and sheep cannot wander off. On a hike last week, the marked trail guided us down stone steps at the backdoor of a house that offers rooms for skiers, and then we shooed geese out of our way as we said hello to a farmer dressed in blue coveralls fixing a water pump. We recently signed on as a Naturpark Partner. Local businesses who share a commitment to preserving local nature, ecosystems and culture are warmly welcomed to join. A great of effort, over many years, have gone into building these partnerships. The high alps nature park Zillertaler Alps is celebrating his 25th anniversary on 07th October 2016. Our guests can enjoy, free of charge, an assortment of hands-on educational programs offered by the Naturpark. Last year we participated in a “volunteer at a family farm” day. We took our Simple Living Guests to this farm where we tasted their in-house cheeses, and the farmers graciously gave us a tour of their eco-farm. (More about them in another blog.) This year we soaked up more information and took part in more of the Naturpark’s offerings.